Prepare to be jealous as you gaze upon the awesomeness that is My Little Escapist Pony. Our very own Chimaera bestowed this amazing and unique gift upon me yesterday: a custom-made, Escapist-themed pony. Hand dyed in Escapist blue and sporting our "e" logo on its flank, it also has a quill and ink pot as a nod to my position as Senior Editor. The pink bow and matching brush, meanwhile, add +10 to overall classiness. A dedication on the hoof says "4 SA," - my initials, in case that wasn't already obvious. This, truly, is poniosity at its finest. While I'm quite certain that my fellow followers of The Way of the Pony are going to want one of these for themselves, I'm afraid this is a one of a kind. 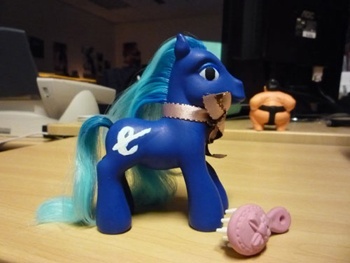 You are, however, encouraged to try fashioning your own Escapist ponies.